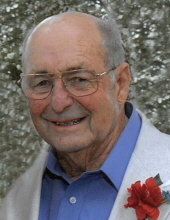 Morris “Morrie” Owen Van Sickle, 93, of Nevada, passed away Monday, March 18, 2019, at his home surrounded by family. Memorial visitation will be 5-7 p.m. Thursday, March 21 at Rasmusson Funeral Home (1418 Fawcett Pkwy) in Nevada. A graveside service will be 2 p.m. Friday, March 22 at the Nevada Municipal Cemetery (1026 First Street) in Nevada. Morrie was born October 4, 1925, in Nevada, the son of Joseph Owen and Chloe Mae (Myers) Van Sickle. He graduated from Nevada High School in 1944 and was united in marriage to Geneva Catherine Hill on December 17, 1950 in Roland. Morrie enlisted in the United States Air Force and was stationed in Bangor, ME and was honorably discharged 1952 and moved to Nevada. Morrie excelled and had a passion for farming. He was a member of the First Christian Church (Disciples of Christ) in Nevada, the Nevada Masonic Lodge #99 and had served as President of the Nevada School Board. Morrie enjoyed his toy trains and gardening. He looked forward to having coffee at McDonald’s and could often be found sitting on the bench outside enjoying nature. Above all, Morrie loved to be with his family. Morrie is survived by his loving wife of 68 years, Geneva of Nevada; his children: Greg (Margene) Van Sickle of Spirit Lake, Jim (Deb) Van Sickle of Nevada and Peggy Longnecker of Nevada; his sister, Doris Samson of Nevada; his grandchildren: Angelina (Scot) Ferguson, Chrissy Pashia, Cory (Mary Kate) Van Sickle, Ashley Van Sickle, Nicole (David) Buse, AJ (Annie) Longnecker and Austin (Jess) Longnecker; and 11 great-grandchildren. He was preceded in death by his parents; his brother, Joe Van Sickle, and his sisters: Mary Horine, Fern Samson and Inez Samson. Memorial contributions may be made to Suncrest Hospice in memory of Morrie. To send flowers or a remembrance gift to the family of Morris Owen Van Sickle, please visit our Tribute Store. "Email Address" would like to share the life celebration of Morris Owen Van Sickle. Click on the "link" to go to share a favorite memory or leave a condolence message for the family.